ABINGTON TWP., Pa. (WPVI) -- A police department in Montgomery County heard the call and responded with full force. Police Departments around the world have been answering the Police Running Man Challenge and now at least one Pennsylvania Police Department - Abington Township Police Department -- has "taken up the challenge." The Challenge apparently began in Australia, swept across Europe, and now has Police Departments around the U.S. offering their videos for consideration. In the Challenge, police officers are filmed doing the "Running Man" dance to the song "My Boo" by Ghost Town DJ, often ending the video with a challenge to other PD's to join the competition. Now, Abington Township Police Department, a 90 Officer Police Department adjacent to Philadelphia, is believed to be the first Department in Pennsylvania to enter their video and offer a friendly challenge to their colleagues. 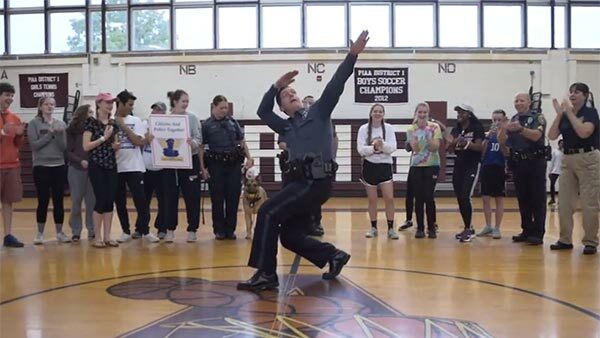 In Abington's video, Police K-9 "Bella" is the star as she overhears the Police Chief's challenge to "find a new, fresh, fun way for our Officers to engage and interact with the youth of our Community," researches the internet, and then rounds up Abington Officers to join Abington students in a dance off. At the end of the video K-9 Bella challenges other Departments in Pennsylvania to "show their moves!" According to Abington Police Chief Bill Kelly "We have always looked for innovative ways to interact with, and engage, the youth of our community. But, especially now, we believe it is important to show the 'lighter side' and sense of humor of the great Police Officers of our Department." For over 20 years the Abington Township Police Department has worked with the Abington School District and other community institutions and organizations to create innovative and pro-active programs intended to create positive interactions with the youth of their Community, and to deter the youth from crime, violence, drug abuse, delinquency and other unhealthy activities. As a result of these community-wide efforts, Abington has been repeatedly been chosen as "One of the 100 Best Communities in America for Young People" by Colin Powell's organization, "America's Promise Alliance" and, in 2013, became one of only four recipients in the world of the prestigious CISCO/IACP Community Policing Award.